Prakash Ambedkar and Asaduddin Owaisi during Aurangabad rally. 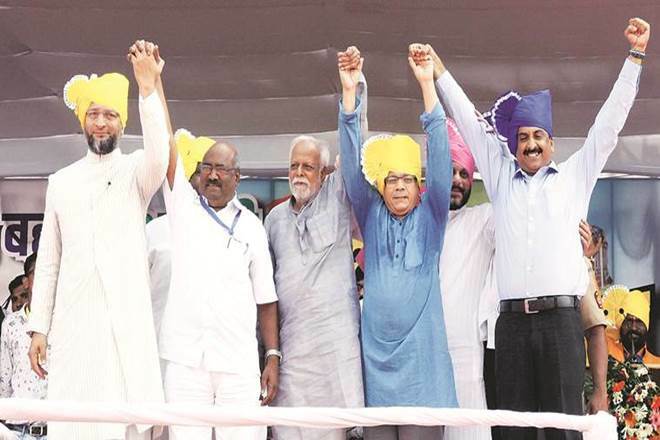 Aurangabad : AIMIM chief Asaduddin Owaisi and Bharip Bahujan Mahasangh leader Prakash Ambedkar shared the stage here Tuesday for the first time after announcing a tie-up for the Lok Sabha and Assembly polls. All India Majlis-e-Ittehadul Muslimeen (AIMIM) chief Owaisi said at the joint rally that the two parties want “freedom” from the Narendra Modi government, as the followers of the prime minister’s ideology have committed “atrocities” on Dalits and the minorities. Ambedkar, a prominet Dalit leader and grandson of Dr BR Ambedkar, called for increasing feelings of brotherhood among communities. “In India, and particularly in Maharashtra, if there is any section that is most backward and living below the poverty line, whose most youths are unemployed and who is facing the oppression and bias of the government, it is Dalits and Muslims.”Owaisi told the massive gathering. “Several parties have ruled the state, but they did little to improve the lot of the two communities,” he said. He asked the gathering to stand behind Prakash Ambedkar.